The St. Anthony waterfall was the true founder of the city – named by Father Louis Hennepin. In the late 1830s, two treaties opened a triangle of land between the St. Croix and Mississippi Rivers for settlement. In 1848, Franklin Steele purchased the land east of the Mississippi River that was soon to become the city of St. Anthony. This purchase gave him control of the water power east of the river. Here he constructed the first commercial mill at the Falls of St. Anthony with the help of a millwright from Maine named Ard Godfrey. Thus began the reputation of Minneapolis as the “Mill City” and the long tradition of industry in Northeast Minneapolis. The people of St. Anthony convinced the state legislature to incorporate their little village as a city, and they received their town charter in 1855. 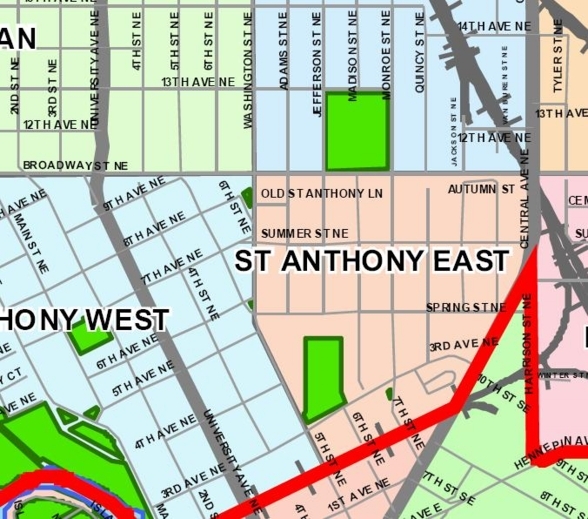 St. Anthony’s leaders dreamed that the city would become the great metropolis of the Northwest. With St. Paul as their only rival, the residents of St. Anthony were more than hopeful that this dream would come true. Because the initial economic success of St. Anthony depended upon Franklin Steele and a few of his associates, the city was on uncertain grounds. When Steele began to have difficulties, the city’s milling industry and its population was surpassed by Minneapolis, the upstart city across the river that had been incorporated in 1867. Just a few years later in 1872, the two cities decided to merge and St. Anthony, by now the smaller of the two, lost its name. Two of the neighborhoods of Northeast, a park, the falls, and a suburb retain the name St. Anthony. St. Anthony East is a neighborhood where the old city of St. Anthony is remembered quite well. Residents take pride in living in the oldest, and to them the best, part of the city.